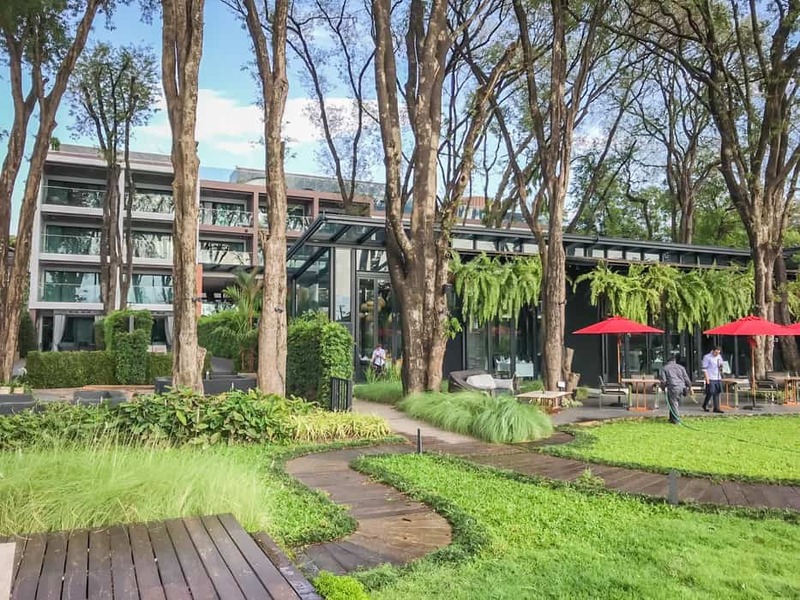 Impeccably modern and perfectly situated in the heart of Chiang Mai along the Mae Ping River is the X2 Chiang Mai Riverside Resort. This five-star, luxury Chiang Mai hotel offers the perfect quiet oasis while exploring Northern Thailand. The Lanna red brick facade sets the stage for the simple elegance within, and this red brick is the backdrop and canvas for a seamless integration between modern Chiang Mai and old-world traditional Northern Thailand culture, as well as telling a beautiful story of an urban setting incorporating nature. It is as-if the perfectly placed bricks throughout the property are containers not just for this peaceful space, but also for the nature that it calls in and holds in place including the 100-year-old tamarind trees. The epitome of boutique, this property has 30 suites each with modern amenities and design. Choose between the Tamarind, Riverfront, Grand Suite River View or the Pool Suite River View, each with modern amenities for the most discerning world travellers. Each suite is equipped with a local Smart phone for guests to use during their stay, I loved having access to a local authority that was easy and readily available. The suites offer a beautiful balance of both indoor and outdoor space with private views of the property, river and beyond. The sun beds and canopies offer a respite for enjoying the peaceful outdoors, while the lush king-size beds and generous bathroom space complete with bathtubs and showers big enough for two make your inside time a beautiful experience as well. There are plenty of nooks to seek and hide in on this property and it was one of my very favourite things about my stay. Built-in alcoves along the bricked pathway leading beyond the lobby, picturesque seating by the river in the garden area, rooftop cabanas and terraced lounge areas, all of which whisper to you to sit and enjoy the moment; the quiet secret of staying at X2 Chiang Mai with the hustle and bustle of the city just beyond the bricked walls. An unexpected surprise at X2 Riverside Resort is the French-inspired fine dining experience at the property’s restaurant. Aproposly called Oxygen Dining Room, this Michelin star restaurant is located in a centrally located glassed-in greenhouse and it feels like you are dining in nature during the day and under the stars at night. I enjoyed a set four-course menu that was absolutely incredible. The thoughtfully prepared vegetarian alternatives were tasty and artistic and full of robust and worldly flavours, a fusion of traditional French cuisine and Asia inspiration. I was wowed by each course which was almost too pretty to eat. This dining experience is the jewel of X2 Chiang Mai. I enjoyed high tea at the property’s H2O Waterbar and Tea Lounge where they serve 50 brands of water both still and sparkling and so many beautiful teas that I had a hard time deciding. The formal tea service is served every afternoon and includes daily finger sandwiches and decadent pastries along with your choice of tea or water. I enjoyed a honey ginger tea and feasted on the most beautifully decadent and lady-like pastries. My high tea view included a private peek into the inner courtyard of the property where the original water well can still be found. This framed space is yet another example of how the design and function marry into a beautiful piece of art taking into account both the natural surroundings and the cultural materials of a time long, long past. If lounging by the pool is on your agenda you will be happy to find the rooftop infinity salt water pool with above city views and built-in cabanas where you can order from the Ozone Roof Bar from 10am until 8pm every day. This space is absolute perfection for getting away during the day, and it is transformed into a dreamy candle-lit space at night, perfect for a nightcap or dip. 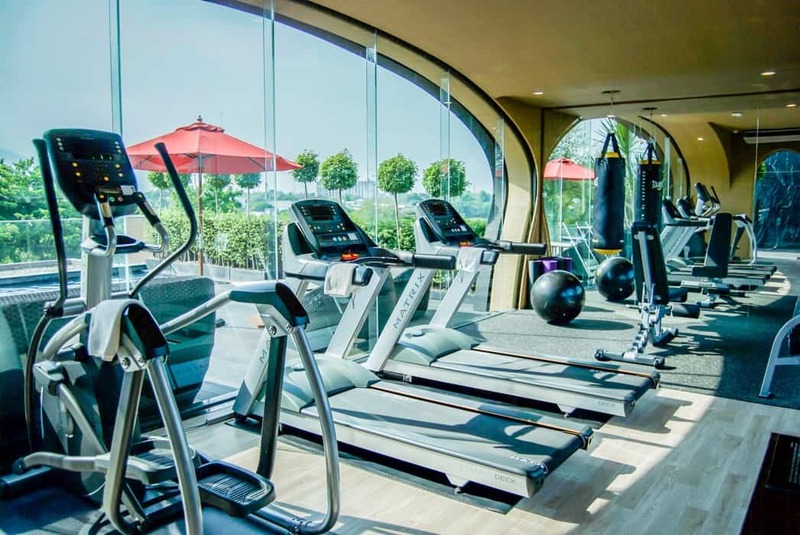 Just off of the pool area is the 24-hour fully equipped fitness centre, a great place to work out any kinks or release any tension. I enjoyed a traditional Thai Massage at the X2 Spa on property, it is located in a quiet tucked away spot with open air views of the river and offers both traditional and modern treatments daily. It was just what I needed before getting on my long flight back home. Each treatment begins with a traditional foot bath including warm water, salts and fresh flowers. The spa space beckons you to sit still, to breathe deeply and to relax fully – I left feeling incredible. The Fit Traveller was a guest of X2 Chiang Mai Riverside Resort for this stay. As always, the opinions, words and images are authentically our own.